This Christmas we shall be having family to stay and I need to prepare our home. With three guest rooms needed in total my little knitting room is proving to be very useful as the sofa in there converts to a double bed. So all the rooms in the house will be in use hence finding a space is tricky! 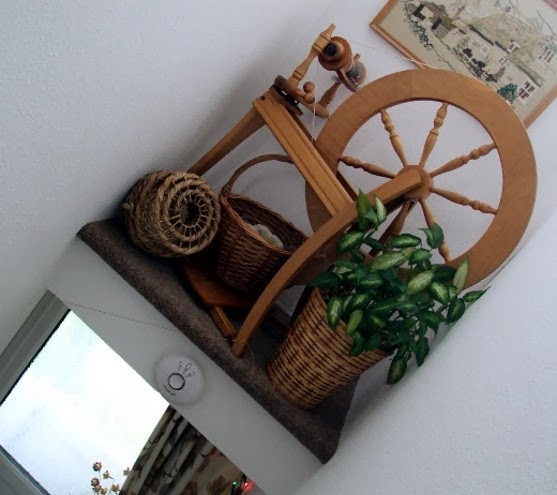 I have folded and stored my looms away and found places and corners for most other things, but my spinning wheel is always difficult to store easily, then I had a idea... 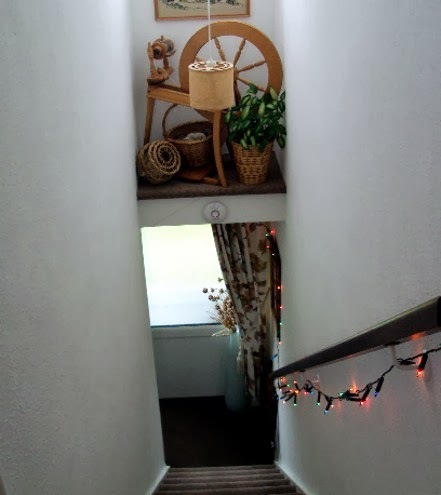 I wondered if it would fit on the small landing above the stairwell... and it just fits! Along with a basket of carded fleece ready to spin- in case I get some spinning time over the festive holidays! safely stored, easy to access and it makes an interesting feature in the hallway. So while my looms are stored I shall be keeping my knitting basket full of small coloured balls of wools at hand, so as I can pick up and knit a few rows making warmers socks and hats while enjoying the company. Also over the Christmas period I hope to re design this blog, so if it looks a bit odd it's only me trying and testing things out. my Casting On and Casting Off adventures. Wishing you all Seasons Greetings and a Happy and Peaceful New Year.